Sutton Knob strives to support the local economy and community in every way we can. One way we do that is through our support of the United Way of Transylvania County. Learn about how we're helping to support their efforts below. Sutton Knob developer Dan Schuessler (right) stands with Steve Pulliam of the United Way and Billy Harris at the grand opening of Sutton Knob in 2014. 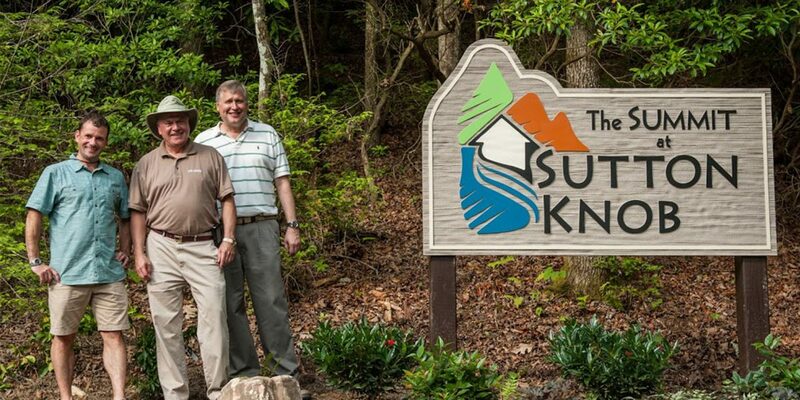 From the beginning, the goals of the Sutton Knob development have been very straightforward for the developers, Dan and Mary Kay Schuessler – to help boost the local economy in Transylvania County by funding a local-centric construction project, while also supporting local initiatives. Click The United Way logo above to visit the Transylvania County United Way website and learn more about how they are helping build a stronger future for Transylvania County. As part of their desire to give back to Transylvania County, the Schuesslers announced in July that they would be donating $1000 per lot sold to United Way of Transylvania County which opens the door to a possible $30,000 in donations for United Way of Transylvania County by the time the development is ultimately complete. To date, the Schuesslers have donated $7,000 to the United Way as a result of five lot sales and the two cottages completed in 2014/2015. Schuessler hopes that the contributions can help United Way’s influence in the community reach even further. “We always appreciate it when people and organizations in the community share their ideas about ways to help United Way reach its goals,” said United Way Board Member Pete Pepinsky. According to the United Way, the organization has three goals for achieving positive community outcomes: increasing residents’ financial stability, raising the county’s high school graduation rate, and improving health care access and healthy behaviors. “We plan to continue to reinvest our lot sale proceeds into the county,” Dan Schuessler said in a recent press release. “When we started this project, we committed to invest exclusively in Transylvania County and we remain committed to that objective to help create more jobs in the county. There are many people in our community who have no other choice but to work outside of the county given limited job opportunities. Being able to be a small part of providing job opportunities in the community is what we are about. It is exciting to see the other developments in the county also supporting Transylvania County as the ultimate mountain vacation destination.